Need for Speed: Hot Pursuit 2, called Need for Speed: Poursuite Infernale 2 in France, is the sixth game in the Need for Speed series and is the last Need for Speed game from the Classic Era. 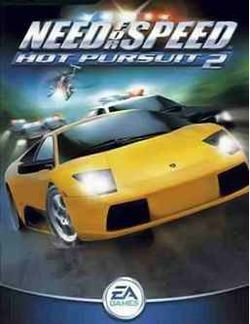 The PlayStation 2 version of Hot Pursuit 2 is the first game developed by EA Black Box and is the first Need for Speed game made for the sixth generation consoles. In 2003, the game was awarded "Console Racing Game of the Year" at the sixth annual Interactive Achievement Awards. Like Need for Speed III: Hot Pursuit, police plays a major part of gameplay and it is one of the few Need for Speed games where you can be chased by the police or you could be the police. Like Porsche Unleashed before it, it was not sold in Japan. Need for Speed: Hot Pursuit 2 introduction sequence. Unlike Porsche Unleashed, the gameplay consists of arcade-style races and police pursuits. The diverse customization options, the special weather effects, and the day-night cycle seen in the last two installments have been dropped. Now players can only change the paint and they can still watch replays as in the original Hot Pursuit, with the ability to multiply how fast the replay plays from 1/8 the normal speed to 4 times the normal speed. The police in Hot Pursuit 2 can call in backup, roadblocks, and spikestrips like in previous games, but they can now also call in a helicopter. The helicopter will drop explosive barrels in an attempt to stop the racer. In the PS2 version of the game, it is possible for spikestrips to be hidden in the barrels. When being chased by the police, there is a bar that will appear above the rearview mirror. When it is blue, you are evading the police, but when it is red, the police think they can still catch you. Below the bar will be one or more stars. These stars represent your heat level. However, the heat level will be restricted depending on the difficulty level selected before the race. Beginner starts at one star and only goes up to three stars. Intermediate starts at two stars and goes up to four. Expert starts at three stars and goes up to five. This page was last edited on 30 May 2016, at 13:31.